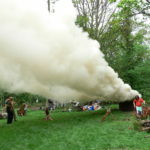 Charcoal is produced regularly through the summer and sold locally. 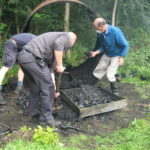 Keep an eye on the Events page of www.ekwt.org.uk for dates. 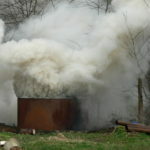 The main raw material is Sycamore which is very good for making charcoal. 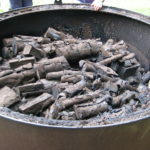 The benefits of our charcoal are that it lights easily and it is hot burning. It is local, sustainable and charitable. 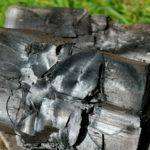 100% of the income from charcoal sales goes into further conservation projects. The body of the kiln rests on six vents equally spaced around the base. To load the kiln, a bottom layer of 30-40cm of brash, as dry as we can find. 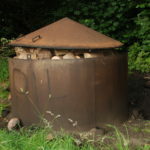 The bottom brash layer is covered by logs piled until they are 30-40cm above the top of the kiln. Then the lid goes on top of everything. 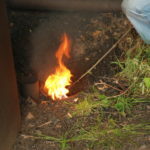 The kiln is lit using flaming brands inserted through three of the vents. 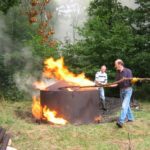 As the brash burns down and the logs at the bottom of the kiln start to burn, the lid slowly settles onto the body of the kiln. 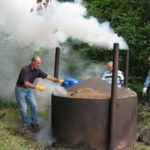 When the kiln is well alight, the lid is sealed onto the body using sand. Tars condensate in this sandy seal making it virtually airtight. The kiln nearly ready for lighting. Still a few more logs to go on top.